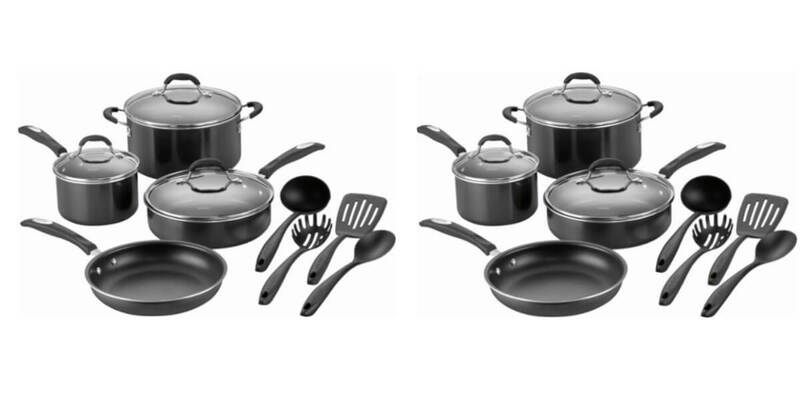 Pick up this Cuisinart 11-Piece Cookware Set $49.99 (Reg. $199.99) + Free Shipping! from Best Buy! Serve food with ease Nonstick coating prevents your meal from sticking inside the panPrepare a meal on your stovetop or in the oven Designed to withstand temperatures up to 350.6°, the set is suitable for halogen, ceramic glass, gas and electric stovetops. Create all your favorite dishes Includes a frying pan, a saucepan with cover, a saute pan with cover, a slotted turner, a spoon, a stock pot with cover, a pasta spoon and a nylon tongs. Aluminum-core construction Promotes even heat circulation and eliminates hotspots. Tempered-glass covers Resist breaking, for safety.